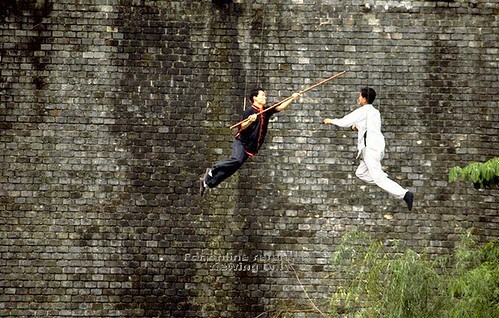 Singapore based Urban Explorers | One-North Explorers: Journey to the West, no more. Journey to the West, no more.
" You know hor…that [insert location name here] got ghosts ah! My friends tell me one! " Isn’t that the usual type of story you would hear, at almost every ghost story session at chalets, campfires, school camps, during your army stint, or even during a casual chat with friends? And yes, as much as we are intrigued by such stories which usually float by during the Chinese 7th month Hungry Ghost Festival, during campfires, at chalets and all those late night B.B.Q sessions, one such story did interest us much more than the others, one which claimed that the Tang Dynasty Village, a former tourist site in the western part of Singapore, was ‘extremely haunted’. This theme park was like any other failed tourist attraction venture, left vacant till another company comes along to do another venture. Was it because of the hauntings? (Most likely it’s too expensive to clear the land for the next better player, it still makes the most business sense to leave it as it is). 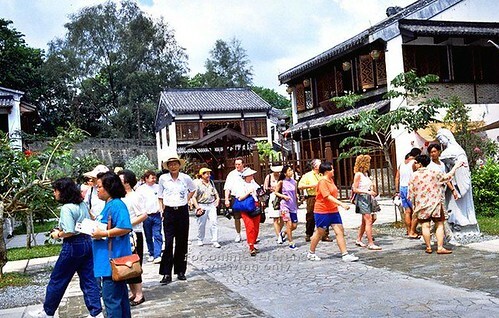 Tang Dynasty Village shortly after its opening in 1992. Information on the place: Rumoured to be built at a cost of $50 million dollars (quoted from online source which is no longer available in 2010, but this seems to have inflated to 100 million! We have appended other interesting links for reading below), it was opened with much fan-fare. The place was popularly used by the local media for shooting numerous period dramas that we saw on television in the 90s. This multi-million dollar theme park is a recreation of the Tang Dynasty capital* which was the center of China's golden age from the 6th to 8th centuries. Behind the high walls the main street features a courthouse, geisha house, shops, temples, restaurants and theaters. Camel rides, craft demonstrations, antique displays are all part of the experience. The park has shops selling refreshments, antiques, a wax museum of Chinese notables, kung fu demonstrations and other street performances. *The ‘City’ wasn’t even fully completed as planned before it met it’s demise. Soon after it’s closure (although the local media did go back now and then to shoot their period dramas), stories came along of the place being abandoned because it was haunted. (yes, the place has a haunted themed house but it’s not why it was closed). And months after, various stories with exaggerated descriptions of hauntings surfaced. And these stories were, of course, unverified, from dubious sources. Apart from torn down fences with huge holes (we don't fancy trying to tear our pants while entering via the fences), there they were, wide open doors, for anyone to just waltz right in. Happily we ventured into the darkness, the doorway leading to a hall of sorts, with a pile of ash in the centre. Someone or some arsonist may have started a bonfire right there. We frown on that kind of vandalism that could destroy the entire complex. A selfish act. We decided to check out the main annex or rather the main office building which fronts the entire ‘city’, walking among the torn down false ceilings, rubbish and empty office cubicles; left over by either previous maintainence staff or visitors, but most of these cubicles have been cleared out and left empty. Outdated notes pasted on notice boards, ransacked souvenir counters, the entire place was plainly a very big mess. We came across a small office which seem different, the walls were black, and we realized someone had set this small office on fire, probably a former disgruntled employee or even a thrill seeking arsonist. Thankfully again, the fire didn’t manage to turn the entire complex into a fire-fighting routine exercise (like it happened for the unfortunate Istana Woodneuk). A walk on the outside led us to the terracotta warriors (which were initially on the 2nd floor during our first visit a week earlier) which we found out were moved to the exterior of the main building. For a moment we were on high alert, but conclusively deduced that it’s probably the work of one or more hardworking fellow explorers or thrill seekers, rather than that of anything paranormal. Hastily we carried on our exploration, checking through the rest of the office building, before taking a stroll across a stone bridge to check out a ‘mini village’ across a small stream/lake/river. The buildings here are of the periodic design, mostly double-storey with Chinese styled windows and walkways. One of the rooms on the upper floor concealed a medium sized paper dragon, one those used during the Chingay and other parades; with remains of what looks like joss sticks offered to it. Interesting. We also managed to find the "haunted house" attraction and, not surprisingly, the walls have all been painted with pictures of ghouls and ghosts to add to the scare factor. The interior, however, was a wreck of broken glass and wooden motifs. Seems like either none of the spooky props were left behind when this place was vacated, or some looter had sneaked them away. Venturing only into those buildings which looked interesting from the outside, it seems like most of the artifacts in the houses were looted way beforehand years ago. We checked the warehouse-like storage facility, and some of us had a shock of seeing huge lanterns… those which we would see in parades. There were even two lanterns in the mold of Mickey Mouse. Leaving the best for last, was the journey up the pagoda. There it was, majestically standing in the dark of the night. We climbed the circular flight of stairs, to the top and were rewarded by an awesome view of night scenery and the gentle breeze blowing lightly in our faces. Sweet. After a good rest, we headed over to the site where they had planned to built a replica of a royal palace and its stables. Here, everything looked incomplete and abandoned. Seeing nothing much of interest, we decided to call it day (or rather night) and end our exploration trip. Conclusion for those rumours of hauntings in Tang Dynasty Village? No, we felt there wasn’t enough evidence to suggest that the location was haunted. Photos did show plenty of orbs, but those are mostly explainable as the place was pretty dusty and they could have been dust orbs or moisture due to the high humidity. Really bright spots are likely to be insects or hot pixels generated by the camera. The location has a big carpark just right in front of it’s main gates, this supports our guess that there would be numerous lorry and bus drivers who frequently park there, either for a curious visit / rest / answering the call of nature, resulting in ‘sightings’ being seen by the general public, giving birth to rumours of ‘people’ or ‘figures’ being seen in the theme park's surroundings; not forgetting that there are amorous folks who frequent the Tang Dynasty Village at night as well. During the years 2004 to 2006, then known as Singapore Urban Explorers a.k.a SGUrbEx (now, One° North Explorers) had most of its explorations focused on paranormal investigation more than on any other genre that we do now (set by then co-leader of a partnering group, who has since left the group). Hence, our priorities on the two night visitations then, were to verify and if possible debunk the rumours of the theme park being haunted. It was a pity that there wasn’t additional trips made to accommodate proper historical documentation of the location during daytime. Sadly, the Tang Dynasty Village was leveled in May 2008 during our group’s hiatus. 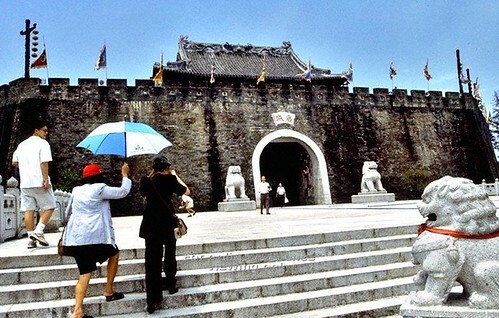 The above article was done in July 2006, titled "Journey to the West", a month after an exploration visit to the Tang Dynasty theme park. Now it has been renamed, with "no more" appended. We are glad this article and photos taken then, never got published due to delay and were kept safely in Andrew’s archives till today. There is much non-historical info on this location, but we decided to dispense with grammar and with the article’s direction, and it’s good to go. © Article and photos - Andrew (熊赴龍).